Sparking Water Dietary Supplement is a HIT! 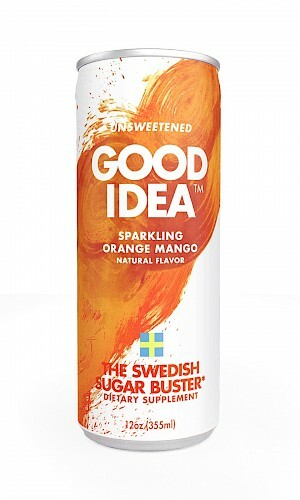 This beverage is designed, according to the company, to help people that have normal blood sugar levels handle the sugar spike that can follow a meal. The research was done at Lund University in Sweden and the company is on a campaign to help the world reduce sugar consumption. Basically the beverage is sparkling water with natural flavor and five amino acids and chromium (which enhances the action of insulin) added to control our bodies reaction to sugar and wean us off the highs and lows from the carbs. The orange mango flavor is just a hint so it won't interfere with the taste of your foods. One can is 10 calories, no fat, no sodium, no sugars.